Designed to keep small living areas free from dirt, dust and allergen contaminants. 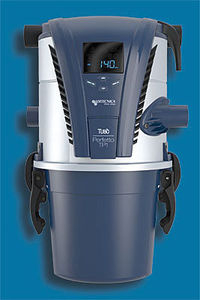 The central vacuum system is permanently installed in the home, either at the time of construction or as a retrofit. To use it, the suction hose is plugged into one of the many inlets and the system turned on. There is a wide range of central vacuum systems suitable for individual dwellings, apartment buildings, office and industrial structures, banks, schools, hospitals, etc. These systems include a powerful cyclonic separation unit installed in a garage, closet, utility room or basement. The strategically located suction inlets are connected to the central vacuum by PVC pipes.